This is no ordinary Mexican fast food joint! 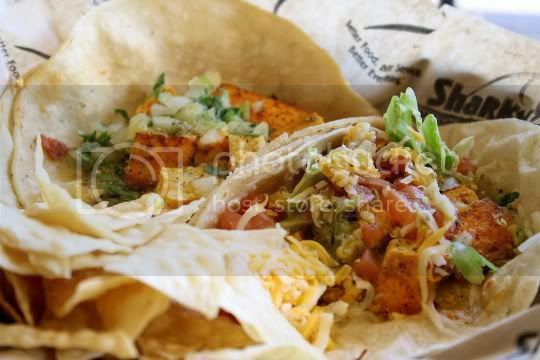 Although it looks like one, Sharky's goes above and beyond some Mexican places' "fresh" theme by featuring organic ingredients, tons of veggie options and sides, and--here's the shocker--tofu! That's right, probably 90% of the menu items (and it's a large menu) have the option of adding tofu to them. From burritos to tacos, salads and pizzas, and quesadillas and nachos, cubed tofu can serve as a delicious substitute for us veggies. And this isn't just plain old regular tofu: it's smoky, mesquite-grilled, firm and chewy, and lightly seasoned with Mexican spices. Only one downside: the tofu is obviously not pressed before cooking, as it seems to add an extra juiciness to items it's included in (be careful, leftovers may get soggy!). Sharkey's also uses organic ingredients, including the rice (options are white AND brown) and beans (pinto and black are both lard-free), and cooking oils are free of trans fat. They even offer an option between flour or low-fat whole wheat tortillas. Yummy and healthy, what more can you want from good Mexican food? Some locations even serve smoothies and beer! 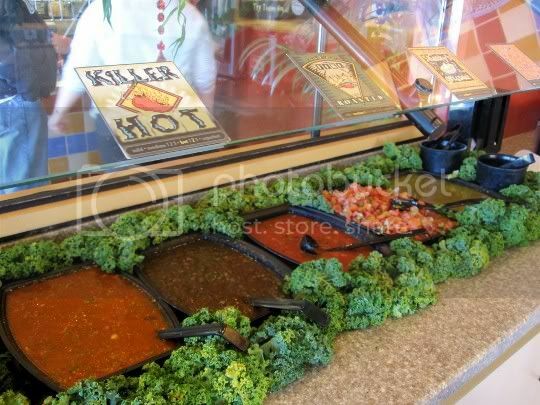 Their fresh salsa bar (who doesn't love a salsa bar?) has great presentation and plenty to offer. The original salsa is very tomato-based; in fact, there isn't much other flavor besides tomatoes (just a heads up!). The other salsas, on the other hand, are very tasty and flavorful. The green salsa is tangy and limey. The hot salsa is tangy and peppery, with a surprising amount of heat that sneaks up on you. But I think the fire-roasted salsa has the best flavor; it's spicy, smoky, and earthy, and tastes amazing on chips or whatever else you decide to put it on. Of all the salsas I sampled, this was my go-to choice. Your typical "street taco" is featured here (but with tofu, of course). There's also onions, cilantro, and more salsa verde. I found the filling amount in this taco (compared to the other one) a little on the skimpy side, especially since the corn tortilla it was served on was doubled. Hey, double the tortilla, double the filling, right? I also thought the flavor combinations proved to be a bit bland; maybe more onions and cilantro (or more filling overall) would have helped that. I did, however, enjoy the sweet and smoky corn tortilla flavor, making this taco seem extra authentic. This was surprisingly my favorite item. A simple yet satisfying taco in a thin flour tortilla, filled with tofu, lettuce, cheese, tomatoes, and tangy salsa verde. It was the perfect amount of taco filling (I hate when there's so much that you need a fork to start eating it), super flavorful, and all-around delicious. It was fresh and light, but another one or two of these would have made an amazing meal. Aside from the taco being overly "juicy" (I'm assuming from a combination of the tomatoes, tofu, and salsa), this thing was lip-smackin' and finger-lickin'. I'd definitely go out of my way to order it again, and I'd definitely go with this taco instead of the Original version (maybe swapping out the flour tortilla with corn for a different flavor). Trying to get your low-carb on? This item is for you. Slices of seasoned tofu are served with your choice of two sides: grilled vegetables, steamed broccoli, Yucatan yams, beans, or rice (okay, not so low-carb). So the grilled veggies aren't exactly grilled: they're just a sauteed mix of red and green bell peppers, red and white onions, zucchini, and squash. Although my palate is starting to embrace bell peppers a little more now than in the past, this mix is exactly why I am not a true fan of them. The bell pepper flavor totally overtakes the other veggies, which are all sitting in a pool of liquid. I'm not sure if it was from the veggies themselves, or maybe some kind of runoff from the tofu, but overall they weren't very appetizing. The yams had great flavor: super sweet, tangy, light, almost fruity. I imagine they're only sweetened with some kind of fruit juice, as their sweetness wasn't overly sugary, just light, fresh, and simple. Unfortunately, I found lots of stringy, tough pieces in each bite...I'm almost thinking they weren't peeled beforehand. Egads! Also unfortunate was the tofu. Although I love it in the tacos and burritos, it really showed its blandness here. Also, it got liquidy very quickly (Sharky's, please press your tofu!). However, a nice amount of the fire-roasted salsa really spiced things up and made it edible. I think it also could have been sauteed (or however they're cooking it) a little longer, making the edges more crisp and chewy. Probably my second favorite item, this huge stuffed burrito was filled with tofu, pinto beans, rice, cheese, guacamole, and salsa verde. This burrito typically comes with sour cream, but I asked them to hold it. This turned out to be a smart move because once again, when the non-pressed tofu came in contact with the guacamole and salsa, things started to get a little messy (I might opt for the guacamole on the side next time). 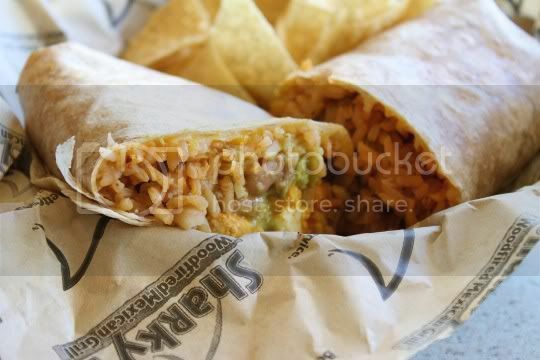 While some of the juiciness is absorbed into the rest of the burrito, there are still parts that will get soggy if you let it sit for too long. That being said, I wish there had been more of the tofu! There was a lot of rice and a nice amount of beans, but that smoky charred tofu would have really stood out if only there had been more. Otherwise, all the flavors were really good together, and this is probably the first time I can ever say I felt like I was eating a "healthy" burrito (in the low-fat whole wheat tortilla, of course!). I'd definitely return to Sharky's in the future. 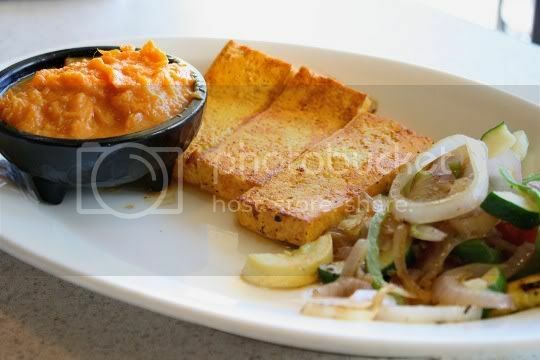 I want to try tofu in every menu item, the salads and bowls especially! Oh, and must double up on those tasty California Tacos. Unfortunately they use lots of oil. They really don't get it at all! 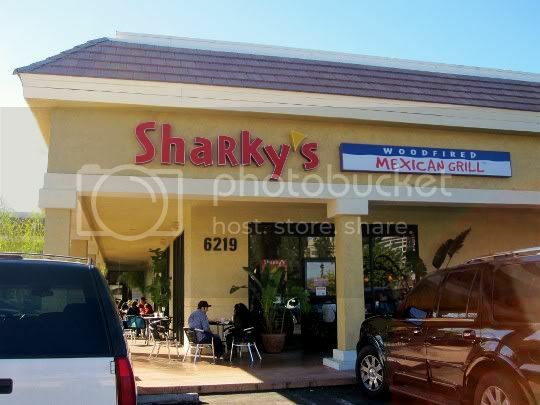 I love Sharkys! Their food is fresh and delicious with lots of unique options other restaurants don't offer. Prices aren't bad and the quantities aren't skimpy. Wish we had one out here!